In a society that is full of options, it can become challenging to teach our children how to make smart choices—especially when it comes to food. At Child’s World Academy, we strive to maintain a healthy and enriching child care center in Monroe where parents can entrust us with providing the best care for your child. If you’re looking for a child care center that brings strong family values and provides nurturing educational care, our child care center in Monroe and Peekskill are just what you’re looking for. Contact us today to schedule a tour and enroll your child in the best daycare! Parents, you can probably agree that battling your toddler to eat their carrots at the dinner table is starting to get old. It’s okay to admit that some evenings it’s just not worth it and you end up letting them win. We’ve all experienced the struggle and we’ve all wondered how we can teach our children to make healthier choices. The good news is it is absolutely possible with a little bit of patience and persistence, you and your family can enjoy a family dinner without fussing over the vegetables. If you’re a parent of a toddler or a preschooler who cringes at the sight of fruits and vegetables, continue reading to learn a few helpful tips that will educate your children the importance of healthy eating. Kids love games! And what better way to get their attention while teaching them something important than an interactive game? Give up your guilty pleasure of playing Candy Crush and download one of these free apps on your tablet for your preschooler to play. The purpose of the game is to stack and sort fruits, vegetables, and whole grains across contraptions in order to score points. This game offers hours of challenging game play along with healthy eating tips and facts. This app will come in handy the next time you and your preschooler visit the grocery store. The game features QR code scanning technology that allows your child to scan barcodes of labelled food items and provides a nutritional breakdown of their favorite foods and will suggest healthier options. Your kids will love being included in grocery shopping and will be more inclined to eat the foods that they picked out! Less of a game, but educational nonetheless—this game breaks down the nutritional information of common foods children eat and recommends a physical activity and the duration of time needed to burn the calories. This app makes the association between nutrition and exercise and makes it understandable for children. Involving your kids in meal planning, grocery shopping, and food preparation they are more likely to become interested and willing to eat the healthy snack they made. While you’re completing your weekly grocery visit, give your child options in each aisle you walk down. Produce section: apples or bananas? Tangerines or oranges? Snack aisle: apple sauce or fruit bars? By providing them options, instead of telling them ‘no’ over and over, your child will feel better about eating healthy snacks because they were the ones that picked them out. If you stock your pantry and refrigerator exclusively with healthy foods, children will have no other choice to eat it. Sounds cruel, but this is why including them in your grocery visits is even more important. If you’re on the go regularly, make sure you are prepared with nutritious snacks that can be easily packed into a cooler or lunch bag. Items such as sliced apples, carrot sticks, whole grain crackers, raisins, grapes, and granola bars are excellent options that kids won’t argue too much about. Studies have shown that the food tastes our children develop reflect heavily on what their parents consume. While you’re at home or around your child, make a conscious effort to snack on something healthy to set an example that you take your health serious too. Teach your child where food comes to better explain its nutritional value. Mix up your shopping routine and head for the local farmer’s market instead. You and your family will have a chance to meet the farmers who grew the fruits and vegetables you are buying and teach them about the care that goes into growing the food they eat. When they ask where cupcakes and candy comes from, they’ll likely be disappointed to learn that they don’t come from a farmer’s market. In addition to changing habits, being persistent and patient is just as, if not more important to teaching your kids to make healthy choices. 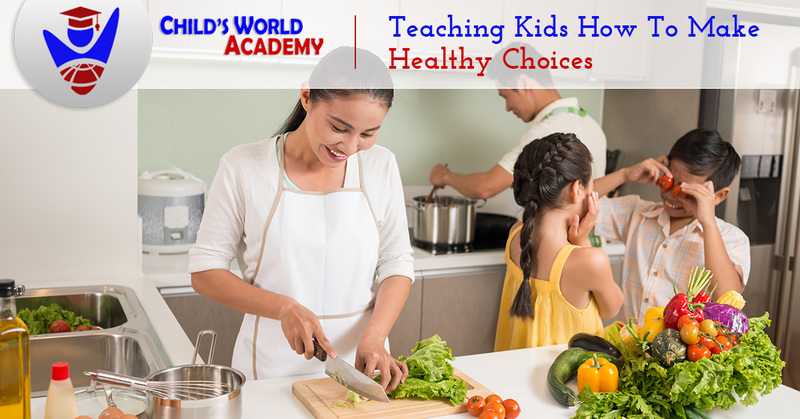 At Child’s World Academy, we strive for using the same family values you have at home and when it comes to teaching and maintaining healthy eating habits, we do our part anyway we can. Visit our child care center in Monroe and take a tour of our daycare facility! Child’s World Academy is a family organization that operates independently to offer families a warm and welcoming environment. We follow a successful curriculum that sets up your children for long term success. We include activities in all areas of learning that includes personal, physical, cognitive and social development and creative expression. Be sure to visit our site to learn more and contact us with any questions!